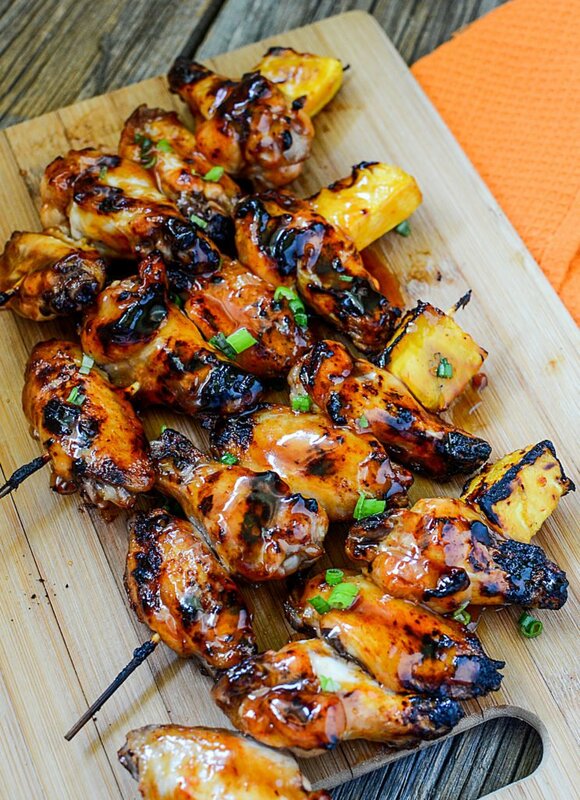 Grilled Wings on Skewers. The thought came to me at 2:18 in the morning. Woke me up actually, can you believe it? I was thinking about different kabobs, skewers, and basically anything on a stick – earlier in the evening. I like to think about recipes and what sort of things I might want to share with you guys and so that’s what was going on in my head, seeing that we are coming into summer. Then I went to bed, fell asleep, and BOOM! Thoughts of Chicken Wing Skewers were brought into this shiny world at 2:18 am. So excited, I lay there thinking about how I’d affix them to the skewers, and what sort of marinade I’d put on these grilled chicken wings. 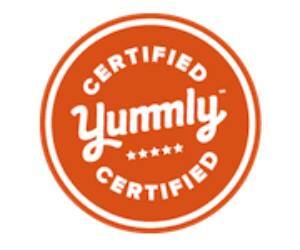 I even thought about grill temps, types of skewers and how spicy I’d like to make them. This is what happens when you are a food blogger. I finally fell back asleep after watching some crazy talk show (Hey, I can’t think about food ALL THE TIME. I have to throw in some Jerry Springer type of crap, just to even out the good and the bad…. lol). Next morning I was off to the grocery store to purchase my chicken wings. I’d decided to go with a spicy/sweet type of sauce for them last night and I concluded that a bite of grilled pineapple would just be the perfect thing to go along with these wings. I love being right. 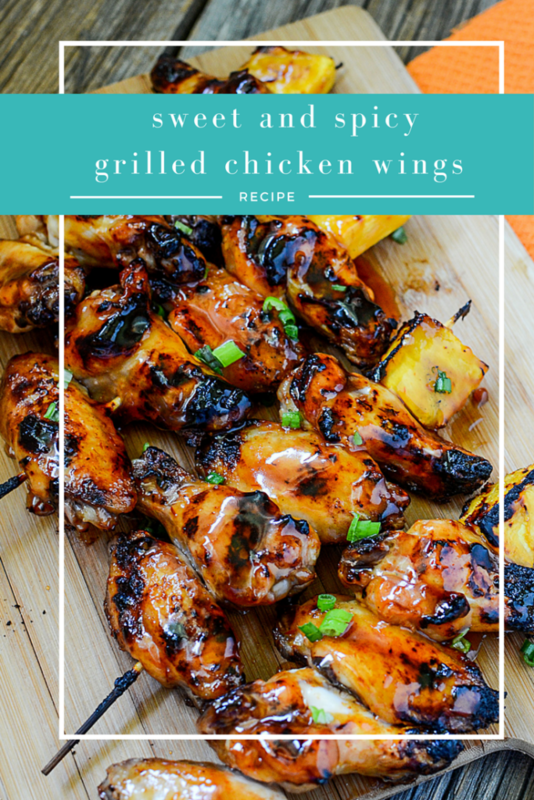 🙂 You have to try them to see, but I can guarantee you – if you like sweet with a tad bit of heat – these grilled wings will be on your menu WEEKLY for the summer BBQ’s, appetizers, game day treats, ect! 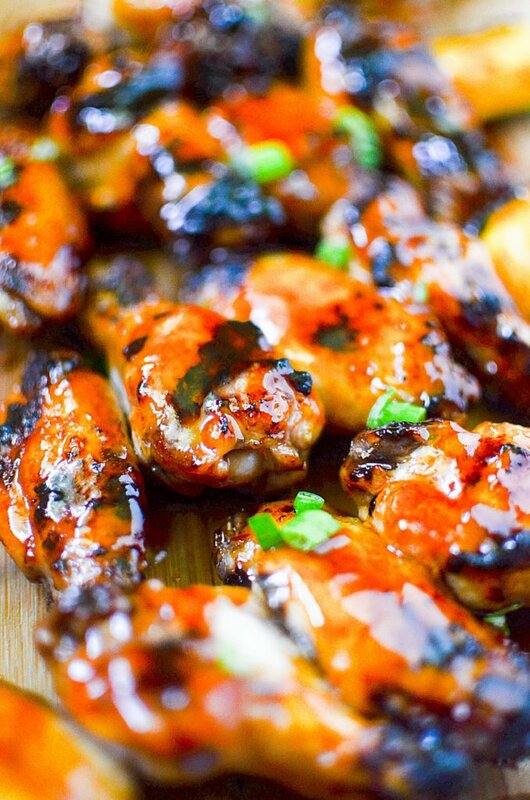 Speaking of game day food, these grilled wings would go perfectly with any of the ideas here too!! 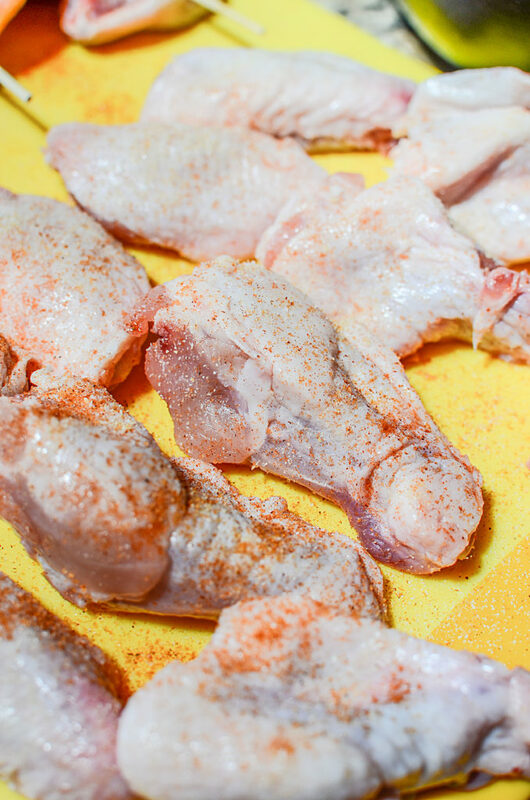 Start off with seasoning your wings. This is a complete must. If you know anything about me by now, you know how big I am on seasoning everything. Even if its a basic seasoning, you must still season stuff.. it’s against the rules if you don’t, and I’ll tell the seasoning Gods on you if miss this step! 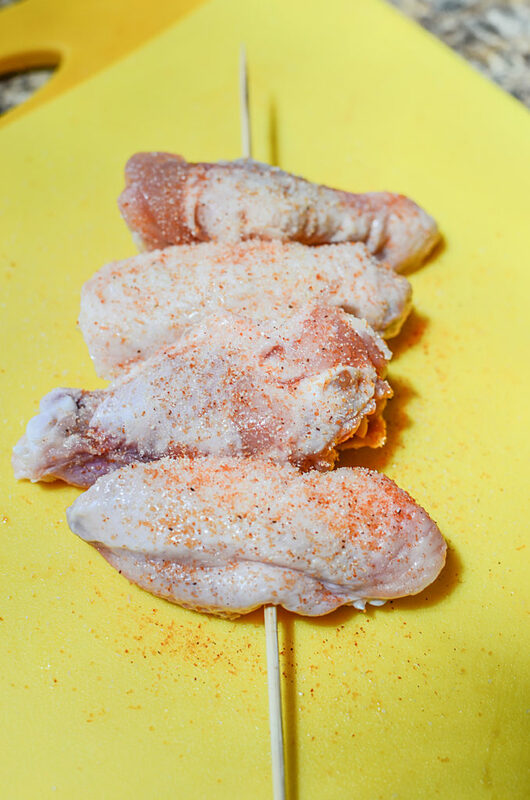 The best way with this actually is to skewer your wings first, and then season. I used just plain wooden skewers, but use whatever you have on hand. Just be sure they’re a good 5-6 inches long on the end to enable you easy handling while on the grill. If you’ve not had chicken wings before, well, congrats on making it here to my blog and making my recipe your first! Somehow though, I’m pretty sure that 99.9% of you have had them before. You know there are two type of wings – the drumette and the wingette…. or, I like to refer to them as “The Flatty and the Fatty”. So, the drumette (the fatty) is the larger part of the wing and is attached closest to the body of the bird. It resembles the drumstick of the bird, so it’s understandable how it got its name. Then there is the wing portion that comes next, which is called the wingette or the “flatty”. There is also the wing tip that no one eats because there’s not a lot of meat on them and they’re kind of a waste of time. They will be attached to the wingette if you bought the whole entire wing of the bird. I often buy these complete wing portions and separate them myself because they’re cheaper than buying them already separated. I keep the wing tips in a bag frozen in my freezer (just keep adding them to other frozen vegetable scraps) to use when I’m making home-made stock or soup. Ok.. ANYWAY. Wow. Still with me? So ok, take those skewers and simple work the pointy ends through the flatty and the fatty so the each portion is laying horizontally. The skewer will poke its way through the path of least resistance and you’ll be able to come out the other end with relatively no problems. I like to put 3 or 4 or maybe even more on each skewer. Thread on as many or as little as you feel comfortable doing. 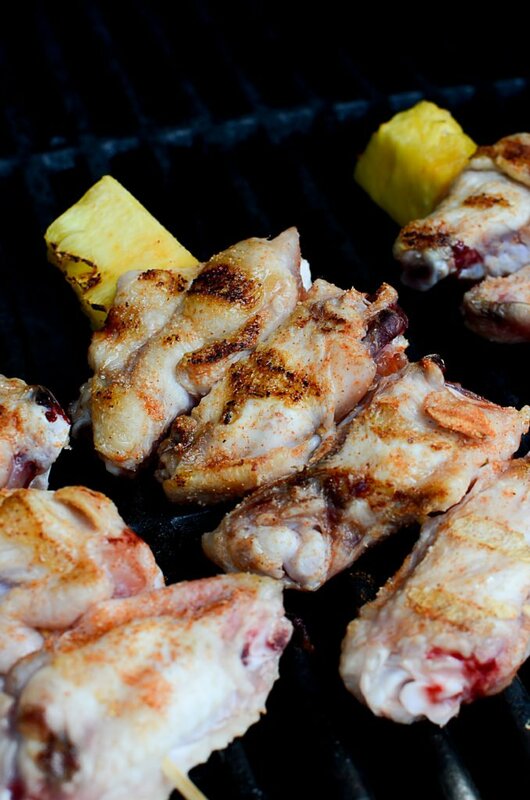 Just remember to leave a tiny bit of room for a big chunk of juicy pineapple to compliment these grilled wings! Season them up and let them sit on a plate in the fridge while you make the sauce. Oh, did I tell you this sauce is super easy peasy???? Omg.. it’s sooo delicious and sooo easy. I’m kind of impressed with myself on this one! In a sauce pan, mix together the vinegar, brown sugar, soy sauce, pineapple juice and ketchup. Bring it to a boil and then add the slurry of cornstarch. Turn the heat down when the sauce thickens. Add the chili peppers or hot sauce (whichever you chose to use). Remove it from the heat and let it cool slightly. Preheat the grill to 350 or a medium heat. Put the chicken wings on the grill, and I would recommend letting the long wooden handle end hang over the edge of the grill closest to you so they don’t burn. 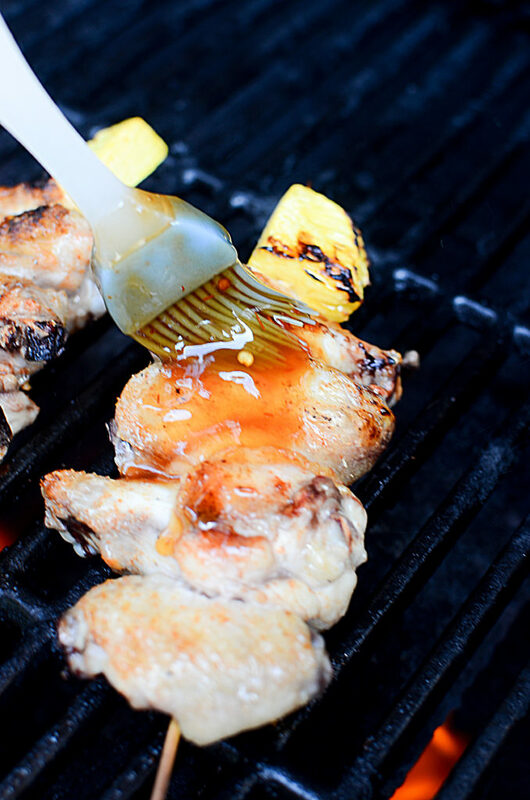 Alternatively, you can soak the skewers in a pan of water for 30 minutes before you thread the wings onto them to help prevent burning. I wanted to eat those wings asap and had no time for soaking…. and the ends of the skewers got a little crispy…. ok, burnt. However it didn’t affect the taste of them and they didn’t fall through the grill! haha! Win! But seriously, these taste better than they look and I’ll bet when you make them, you’ll wonder why you hadn’t made grilled wings on skewers sooner. Grill the wings on both sides for 5 minutes each. Then, begin basting with the sauce we just made. It’s best not to glob it on in the first go. Just lightly brush on the sauce, and don’t forget to also include the sauce on the pineapple, it’s just amazing!! So the key is a good brushing of the sauce, and then flip and cook for a few min. Then brush the top side and flip again to cook. Just continue this until the wings are cooked through. (approximately 20 minutes). What????? 20 minutes isn’t a long time! ESPECIALLY when you have a cool slushy margarita, or a maybe an ice cold beer, or even a combination of them both!! (don’t knock it till ya try it! ). So that’s basically it, my lovelies. Not much to it, but the payoff on the flavor is WORTH EVERY STEP. These grilled wings are so kickass that when your family and friends eat them… they’ll beg you to make them again an hour later. It’s true. It’s happened before……. or wait….maybe they were begging me to make the “Beergarita” again??? Well, either way, all those elements combined spell a super great time and happy tummies. 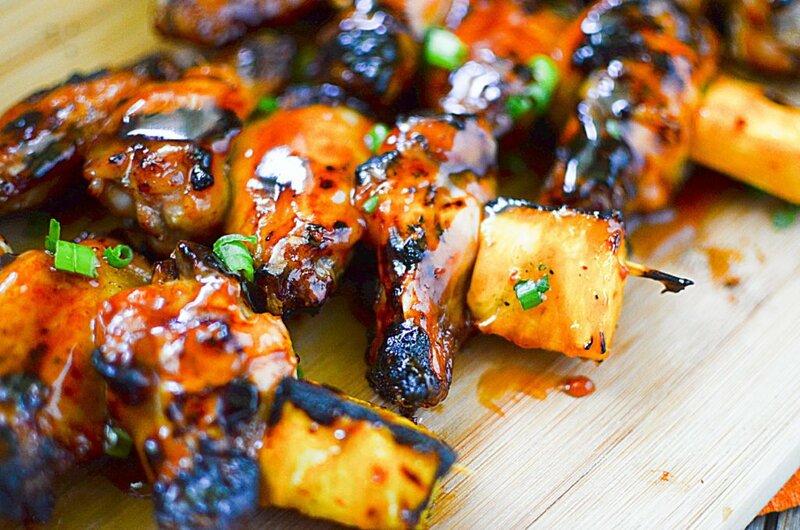 Sweet and spicy chicken wings ON A SKEWER and grilled! Nothing could be more perfect when you're craving wings!! 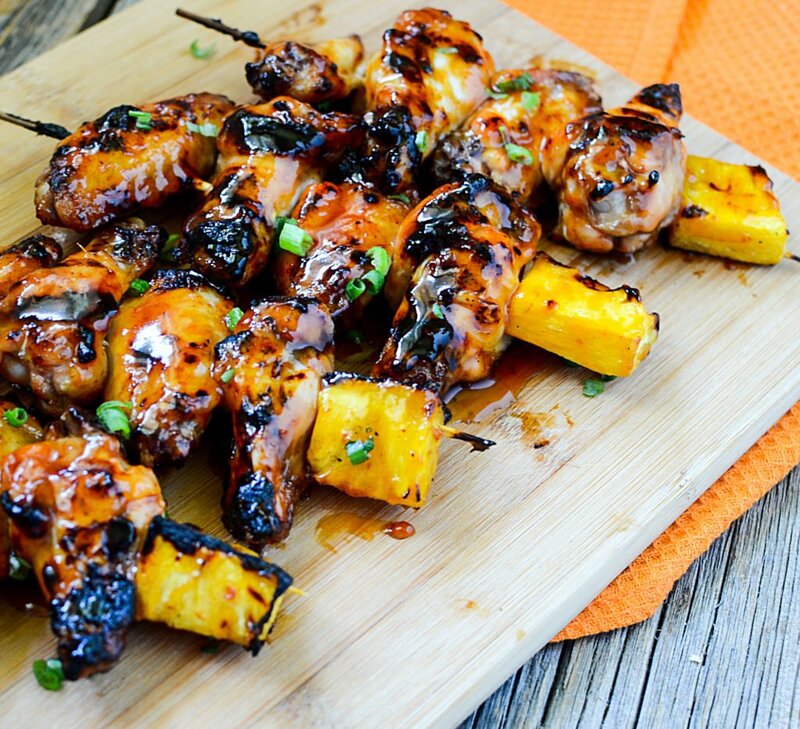 Thread the wings onto the skewers evenly (3 or 4 per skewer) and add one chunk of pineapple on the end of each one. Bring to a boil, and make a slurry with the cornstarch and water. 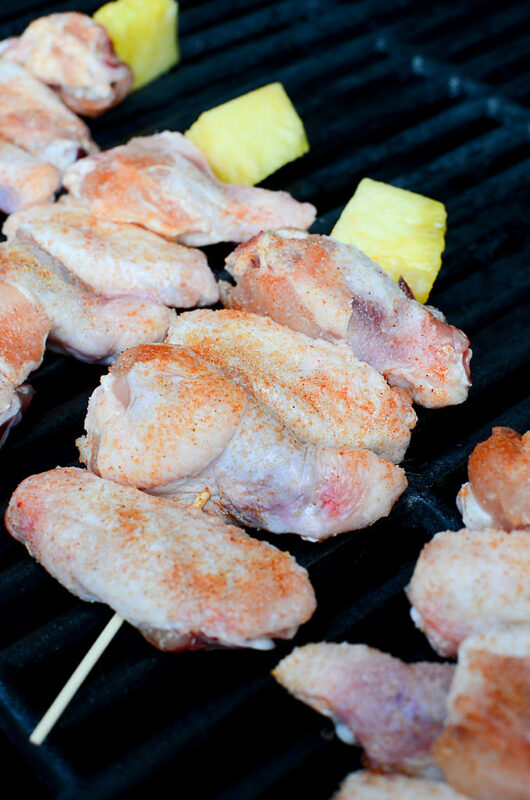 Begin basting the skewers on both sides and grill for approximately 20 minutes or until the wings are cooked through.